The dawn of human civilisation has known the stone-age man. Since then homo sapiens have not stopped evolving physically, mentally and technologically. The stone-age man knew only hunting for his food and reproducing his kind. Gradually as the population grew larger, they discovered food from plants, fruits, animals and other means of livelihood. During that period when the number of people was growing, the struggle for food and land progressed. This led to the nomadic era and agricultural development. Cutting across millions of years, evolution has led mankind to the age of technology where different branches of science have revolutionised the way of living of nearly every individual. Material advancement has mounted to such a height that man has started exploring the other planets. However, all this has hardly revealed the real identity and origin of man. Psychology means the logic of psyche and in Greek, the psyche means soul. Both ancient and modern psychology does not explore the reality concerning the soul. Psychologists are lagging with the unconscious and the subconscious mind, with the exception of Carl Jung who has given hints about a higher reality than that of the mind. Eastern wisdom and Egyptian knowledge reveal the spiritual or divine aspect of man; they throw light on the psyche. Innumerable are those who have known the psyche and have been transformed through it into divine beings: Eckhart, Jesus, Hermes, Pythagoras, Krishna, Buddha, Mohammed and Moses are a few names. So far as material development is concerned, we have reached the apex. There are lots of ingredients for sensual gratification. All these, however, have not led to contentment that will create a harmonious and blissful environment. It is as if man has gone berserk; he moves in whatever direction his senses lead him. If this state of affairs continues, then very soon we run the risk of being called a non-human race. Yet at such a juncture, there is hope. The New Man is coming. Many people are beginning to experience, through scientific methods, their psychic or spiritual nature. Man is having a glimpse of his mental and divine status. There have been a few who have dared to walk where most fear to tread. A few lights have started appearing in different corners of the globe. Maharishi Mahesh Yogi, the founder and leader of TM organisation says that we are at the age of the dawn of enlightenment. The Brahma Kumari organisation sees the Sangam Yug, which means ‘age of transition’, to which I add the psychic era. The mind has done its level best to satisfy the senses so much so that a nuclear war is perhaps at hand. The mind wants complete, eternal rest and bliss, for that is its real origin and end too. It is no wonder that it starts questioning its real nature. This is why everywhere people are embracing different sects, cults and religious organisations. Meditation is the ultimate step in the path that leads to complete psychic illumination, which is coming slowly but surely. People are getting more interested in yoga and mysticism. A deep study of pure religion will throw light on the secret behind man, creation and the mystery called God. It is fascinating that some schools in the East even have a science that shows step by step the way to the Divine and does not require faith in any god. The yoga school is one of them. It goes beyond morality and immorality. It simply acts as a map to assist in the journey towards the ultimate reality. It explains scientifically the relationship between man, God and the Universe. The aim of yoga is to lead one to union with God – the ultimate stuff of existence and which has given birth to it. 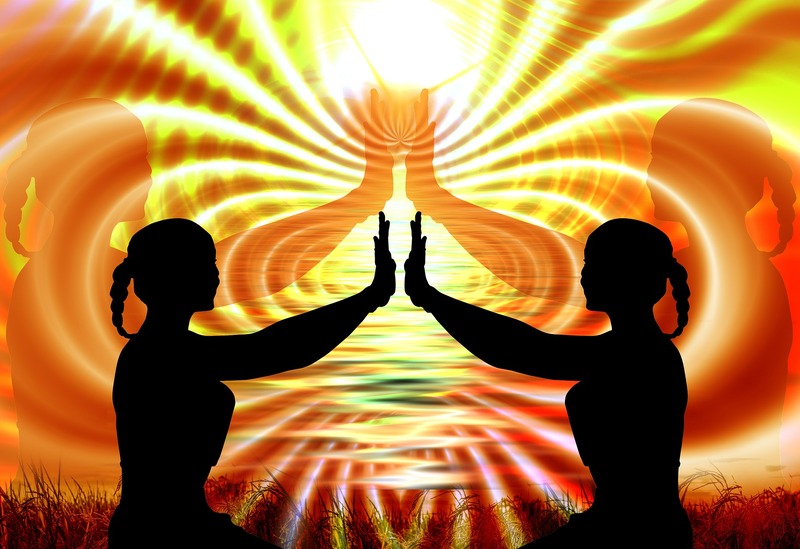 Apart from yoga, there are other approaches to realise the psychic part of our being. In fact, the means are innumerable while the goal is one. Those who are growing in the spiritual dimension are shedding their lustre and that is helping others to join in. A large number of spiritually awakened people will create a very strong psychic chain and if this trend continues, the whole world will benefit. Spiritual vibration is beneficial not only to mankind, but to plants and the environment as well. The spiritual wave is going higher day by day. It is bound to be so as the predictions of the ancient seers and prophets are becoming true. However, the negative and unhealthy vibrations of thoughts that are presently pervading our atmosphere will strike each other, creating a chaos. Also, we should not forget that the huge amount of evil action performed by people is bound to reap its fruits. But as goes the saying, truth always triumphs. There will be a cleansing process by a still bigger wave, by a spiritual giant. Then a better world with a new kind of man will be born. Therefore, the Kingdom of God is at hand. Repent, that is, start mending your evil ways. Have recourse to the psychic science for mind transformation for it is the mind itself which is at the base of everything. The soul is hidden in the mind; the soul is God. Cleanse the mind through scientific methods, prayer, meditation, love and honest reasoning. The near future is bright, but the chaos has to be accepted first. Be ready, work and wait.